It is impossible for me to talk about Stella! without talking about its ebullient chef and owner, Scott Boswell. His life story sounds like something out of the Adventures of Buckaroo Banzai Across the 8th Dimension. He came to professional cooking as a third career, yet in a short time since then has done stints with Iron Chefs Masahiko Kobe, Hiroyuki Sakai, Chin Kenichi and Masaharu Morimoto (and stages with other luminaries such as Grant Achatz, Charlie Trotter and Eric Ziebold as well). He was one of the first chefs to start the return to normal life in New Orleans after Katrina wreaked devastation, slinging burgers hot off the grill at his not-yet-opened Stanley restaurant for folks in need of sustenance, even as his flagship, Stella, in the middle of a renovation, was demolished. If you told me that he performed a heart transplant in between courses during our meal, I wouldn't have been surprised. I also can't avoid talking about Chef Boswell because I likely wouldn't have had the chance to eat at Stella without his intervention. Our New Orleans travel plans fell into place late: I only knew around December 23 that we'd be going there a few days later, and there were very limited seatings available the day we hoped to visit Stella. But I also knew - because Chef Boswell is an avid (possibly compulsive) twitterer - that he was in the market for a Momofuku cookbook , for which Amazon had seemingly misplaced his order. I offered to bring him a copy in a transparent effort to curry favor. Though Amazon ultimately rectified his book order, he nonetheless bent over backwards to set us up with a reservation. And when I say bent over backwards, let me be clear: he personally arranged a reservation for us, on the afternoon of Christmas Eve, from Orlando, while on vacation, with his family, in the middle of roasting a 50-pound pig. And then tweeted, emailed or called about a half dozen times during the days thereafter to make sure we were coming. I was floored. We eagerly arrived a few days later. The restaurant is an eclectically decorated place toward the northern end of the French Quarter, with two separate dining rooms that somehow feel both elegant and homey, perhaps bordering just on the edge of kitschy - like visiting the house of a fancy, rich grandma. As we entered, I spied Chef Boswell in the doorway to the kitchen and upon introducing ourselves we were greeted warmly and shown the kitchen. Chef Boswell is a bundle of non-stop energy and has the perpetually pleased look of a kid in a candy shop. When he's not in the kitchen, he's peeking around the corner to check on the diners like a mother hen tending to her flock, or sometimes roaming the dining room cradling a truffle seemingly the size of a baseball in his hand. I suspect that truffle has embedded its aroma in his palm like an olfactory tattoo by this point (maybe that's his plan). Truffles, caviar, lobster, more truffles ... this is a menu that reads like one of those Iron Chef episodes (the original, not the American spin-off, that is) where the chefs are trying to sway the judges by shamelessly plying them with luxurious food products. Stated another way, it seems like a menu drafted by someone who isn't paying for their own ingredients. It is indulgent and over the top, all in a good way. 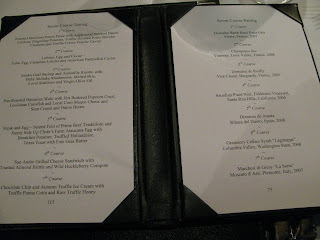 Though the wine pairings were tempting, a decent selection of half-bottles provided the opportunity to get to know a couple wines in a little more intimate detail, and so we had a 2007 Louis Michel Chablis Premier Cru Montmain, and a 2005 Arcadian Fiddlestix Vineyard Pinot Noir. Our meal started with a light, delicate bite - a Louisiana shrimp infused with kim chi, nestled in a mango purée, crowned with crispy taro strips. The sweet-spicy aroma of the mango provided a nice bridge between the sweet crustacean and the kim chi flavors, though I would have enjoyed even more chile heat. 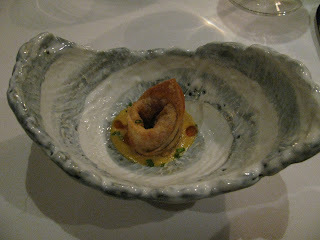 A second amuse bouche followed, this beautiful eel kabayaki wonton atop a puddle of a yellow curry sauce, in an equally beautiful glazed ceramic bowl. There was a nice crunch to the fried wonton, contrasting with the rich, salty-sweet filling within, all enhanced by the curry spice which was further enlivened with dots of chile oil. A potato soup seems an unlikely thing to get excited over. 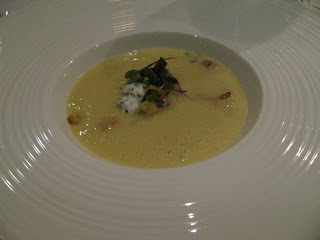 This was a fantastic potato soup. The purée was thick without being pasty, rich with a deep potato flavor, enhanced but not overwhelmed by some bacon lardons, and reinforced by coins of fingerling potato scattered throughout. The earthy flavor of the potato was elevated by tiny truffle-infused brioche croutons, as well as a crème fraiche that was also infused with truffle, and dotted with caviar. This was just pure pleasure. 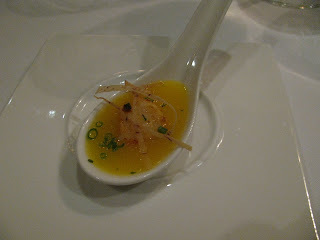 Rich scrambled eggs were mixed with tender bits of lobster, and crowned with a generous dollop of paddlefish roe. 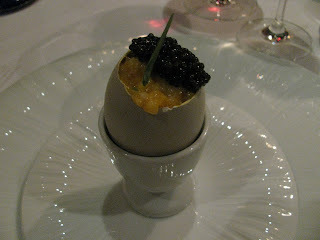 Creamy egg, sweet lobster, salty briney caviar. This could be the breakfast of champions. Chef Boswell's culinary influences are clearly global in scope, and his food is much less distinctly "New Orleans" than anywhere else we've eaten in the city. Yet this dish, a risotto highlighting Gulf shrimp and andouille sausage, is clear by its ingredients as to where it comes from. The pairing of shrimp and pork is often an auspicious one, and it is so here, with shiitake mushrooms providing yet another layer of flavor. The only component here which I thought might be superfluous was the Brie. 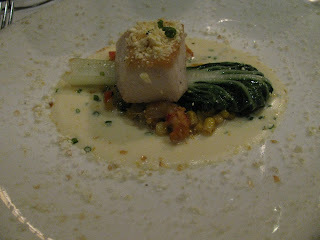 This was one of the most inventive dishes of the night - a walu (a/k/a escolar, and fortunately a small enough portion not to risk the dramatic side effects), served over a bed of crawfish-studded macque choux along with a spear of young Swiss chard, resting in a pool of rich, creamy sour cream and onion butter (an inspired twist on a classic combination, albeit one usually found in a bag of potato chips) studded with chives, the entire plate showered with a confetti of little buttered popcorn bits. A classic pairing of fish with butter sauce, in a completely different way. Speaking of twists on classic pairings - this was hands-down the most luxurious steak and eggs I've ever had. 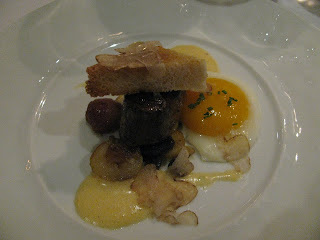 A petite tenderloin filet was perfectly seared,[*], and plated with a fried egg with a beautiful sunset-orange yolk, thin-sliced sauteed potatoes, a slice of "Texas toast" smeared with foie gras butter, and a truffled hollandaise - plus an unadvertised, and generous, shaving of fresh white truffles from that baseball Chef Boswell had been carrying around the dining room. I've actually had some disappointing truffle experiences this season, with tired, weary truffles barely carrying any scent or flavor. These had no such problems. 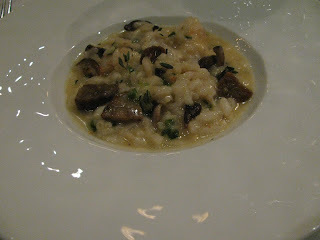 Their earthy, intoxicating aroma was evident from across the table, and permeated the rest of the dish. This was a pull-out-all-the-stops kind of dish - no time spent worrying "Is this too much?" And it wasn't. 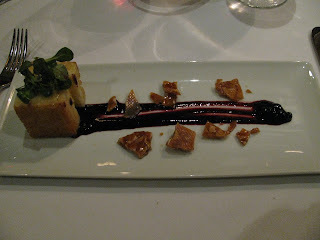 Next was a nice spin on a cheese course - a little grilled cheese sandwich of buttery light brioche around melting St. Andre cheese, with a smear of huckleberry compote and shards of almond brittle, and a little hat of lightly dressed micro-greens to keep things from going too sweet too soon. Just in case we hadn't felt indulged enough, this dessert offered truffles yet again, in four different forms no less: infused into the panna cotta; in the chocolate chip ice cream; in the honey, also flecked with bits of mint; and as a slivered cross-section of black truffle, fried in a tempura-style batter. Perhaps the most revelatory was the ice cream. Though I had expected that the cold temperature would mute the truffle, its heady perfume was actually infused throughout the cream - clearly present but not overwhelming. 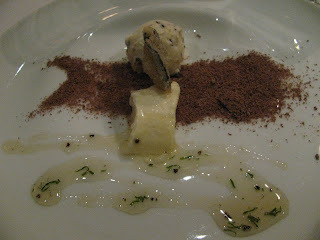 The other components played on different textures: the creamy, wobbly panna cotta, the dusty powder of chocolate, the sticky honey, the crispy truffle chip. This dessert happily avoided being too sweet or cloying. 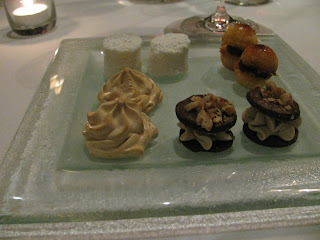 Finally - and perhaps lost on us, too stuffed from what had preceded them - a selection of mignardises: little mini macarons, marshmallows, meringues, and cookies, the details of which have sadly been forgotten already. You will not meet a chef as enthusiastic or as generous as Scott Boswell. When we spoke during our dinner, Chef Boswell mentioned how, despite his love for cooking, he had always hesitated to make a career of it because he didn't want to turn what he loved into "work." Yet Stella is clearly a labor of love, one where the chef's passion for food seems to have unbridled outlet. And there are few meals I've had where the personality of the chef translates so directly onto the plate. The food here is worldly, eclectic, everywhere-at-once, playful, luxurious and indulgent, yet simultaneously precise, focused and meticulous. You could say all the same things about Chef Boswell himself. [*]You can read about Chef Boswell's "sear, flash-freeze, sous vide & fry" technique with steak here, though with one point of clarification: chef says the meat is only briefly bathed in liquid nitrogen just to halt the cooking process after searing, and never put into "deep freeze" after the cooking process has started. I've mostly seen recipes that call for beef to be coooked sous vide first then the exterior seared before service; reversing that order, as here, would seem to give even better control over the ultimate serving temperature. Awesome post. Awesome story. Awesome meal. Thanks for clearing up the sous-vide preparation. I thought it might be something along those lines after hearing a couple of years ago that Scott would dip a duck tenderloin into LN2 to firm it up enough for grilling. The quick freeze would obviously thaw and cook during the grilling, and assist in what would be an almost impossible culinary task. Yet another amazing use for the compressed nitrogen. Got to get some eventually.